Kubera or Lord Kuber Is the God of Wealth and the God�s treasurer in the Hindu and Buddhist pantheon. Kubera is also one of the eight Lords of Horses and opens avenues of wealth & riches and brings continuing prosperity into any home that displays his image. 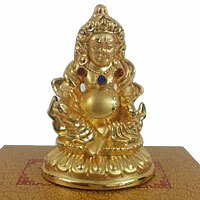 Kubera however is most well-known and revered for overcoming obstacles that block your wealth luck from manifesting.